The panel-brushed horse from the Chauvet cave. Photo: Valérie Feruglio/French Ministry of Culture and Communication. A stadium-sized cavernous gallery which cost $US59 million to build has opened in France to display, among other images, some of the world’s most iconic horse artworks – all of which are faithful reproductions. 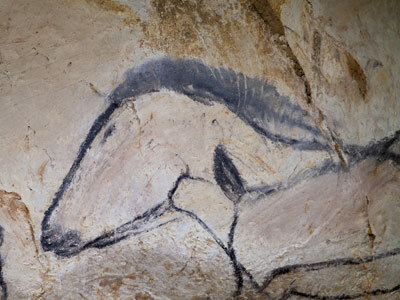 The French Government has opened a replica of the Chauvet caves, which contains some of the most sophisticated artworks created by primitive man, including remarkable depictions of horses. The works within the Chauvet cave comprise buffalo, rhinoceros, lions, and dark-maned horses – all in a fine state of preservation. In all, there are more than 400 depictions of animals from Ice Age Europe. The works were created between 32,000 and 36,000 years ago and, while not the oldest human cave art discovered, the workmanship and creativity is considered to be in a league of its own. The Grand Panel of the End Chamber is one of the most abundantly decorated areas of the cave. Photo: Jean Clottes/French Ministry of Culture and Communication. The Chauvet cave, also known as Decorated Cave of Pont d’Arc, was discovered near the Ardeche River in south-central France only 21 years ago. The works were in a remarkable state of preservation, due to the conditions within the cave, which had been closed off for thousands of years due to rockfalls. The French Government, aware of the damage to the ancient art in the Lascaux cave system due to millions of visitors and the introduction of fungi and bacteria, moved quickly to close the Chauvet cave system to the public. But now a stadium-sized replica, complete with fake stalagmites and stalactites, has been built to show members of the public the treasures preserved within the original. The reproduced cave, several kilometres from the original on a pine-covered hill, was illustrated by a team of artists, aided by the projection of photographs of artworks on to the gallery walls. They carefully copied the paintings using the same materials used by the original artists, including charcoal made from Sylvester pine trees and ochre paint manufactured from minerals. The reproduced works are the same size as the originals. Even though the replica is the size of a stadium, it is still not even half the size of the 91,000-square-foot Chauvet cave. The replica will be open to visitors who must go through in guided groups of about 30, following a catwalk with 10 designated stops. The cave replica was eight years in the planning.